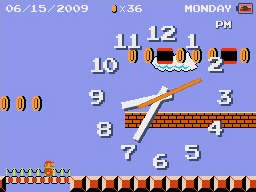 A clock utility for the Nintendo DSi featuring sprites and scenes from Super Mario Bros.. You can tap the A Button to make Mario jump and collect coins in the background. Select between analogue and digital displays, 12 and 24 hours and change the time without changing the time set to the Nintendo DSi. You can also set an alarm function.